There were only two, possibly three times in the last decade that I was able and actually parked a car in the garage at my home. Or should I say, that I had space to park one of our cars in the garage. While I reject the notion that a middle-aged Boomer couple in Post-Modern America cannot bear to part with stuff – one of the driving forces behind the self-storage industry growth in the latter part of the 1990s – I seem unable to part with items of questionable use or value. Once before, in the weeks following a particularly awful fire season ( wildfires in 2007 were encroaching our San Diego county community), we went through our boxes, plastic storage bins, and odd nooks and crannies to see what we might want to take with us -if evacuation were ever needed again. For my spouse, the most important treasures are a couple bins with pictures of the boys growing up, mementos from her late mom, and the childrens’ “artwork”. I have random boxes of Navy memorabilia, books, a few things handed down from my mom, and dozens of random items – toolbags, saws, lubricants, parts from a discarded wheelbarrow, handles from discarded brooms, a few 2 x4 boards, partial rolls of several kinds of tape, a couple cedar boxes of cremated pet ashes, an old Bentwood rocking chair, camping supplies, and boxes of Christmas decorations. Clutter. And that was AFTER we had the kids pick up their boxes of mementos and random bits, and spent days taking things from the garage to GoodWill and the dump. We even had moved everything to a storage unit so I could rewire the garage and insulate it. That lasted three months. 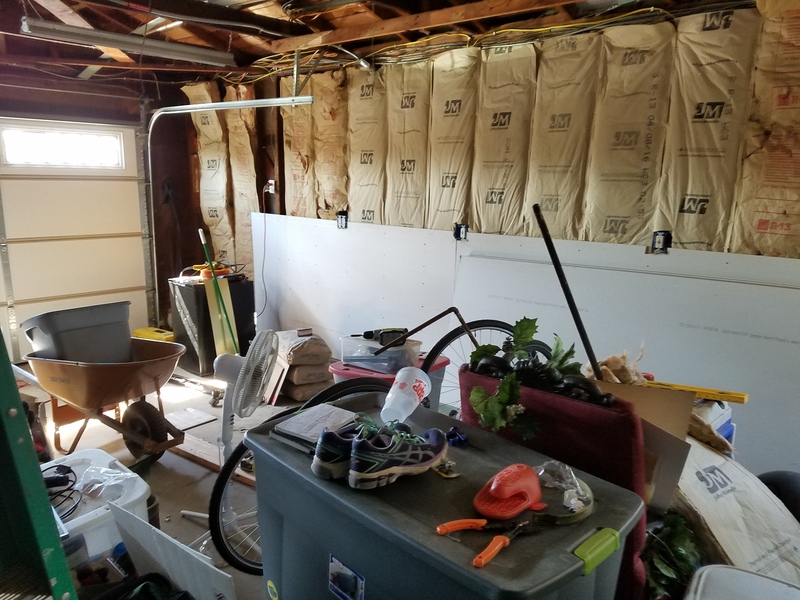 I did get that started, but then for the past year I was looking at an insulated wall ( yes, I only got to ONE side of the garage), until this past weekend. I have started to install the drywall now. But I realize I need to move clutter again to have sufficient room to do a good job of installing it. And I have to make time to write. So clearing out the garage to install the drywall is going to take some time. Maybe this evening, I will make a start (again). But then I am going to help my spouse prepare (barbecuing) chicken for our work-lunches this week. Feng-shui is a process of harmonizing my garage; whether I finish anytime soon is the question. The spirit that lives in my home probably is comfortable with clutter.